The Digi XBee3 series is designed to support IoT innovation and computing capability at the network edge. Digi XBee3 provides MicroPython programmability and dual-mode radios, with the ability to upgrade via software to Bluetooth LE, enabling local device connectivity from a smartphone or tablet. Digi XBee3 adopts a modular approach to IoT connectivity that includes options for Zigbee, WiFi, or cellular, including LTE-M and NB-IoT. Digi XBee3 enables innovative IoT solutions that can be more quickly developed, prototyped and mass-produced for optimal return on investment. Remote IoT Connectivity with Digi XBee3 Cellular: This demonstration showed remote device management between a Digi XBee3 Cellular device and the cloud-based Digi Remote Manager by remotely monitoring and controlling devices located in multiple locations directly from the trade show floor. 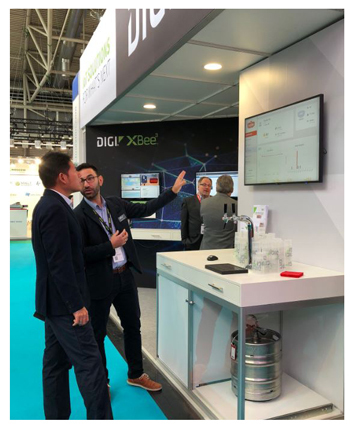 SteadyServ iKeg: This application demonstration showed the SteadyServ iKeg using sensors to measure keg volume, analysed the data locally with a Digi ConnectPort gateway, then sent the analysis into the cloud over a Zigbee connection. The iKeg application presented the cloud-based information to bar managers to help accurately inventory and proactively order more when beer runs low. Safe to say the show was a success all round, and for Digi with the iKeg a personal highlight for Electronic Specifier!